After the Brexit / EU Referendum vote, the Isle of Wight’s counting officer has returned the results. The EU Referendum count on the Isle of Wight has now been completed and verified. 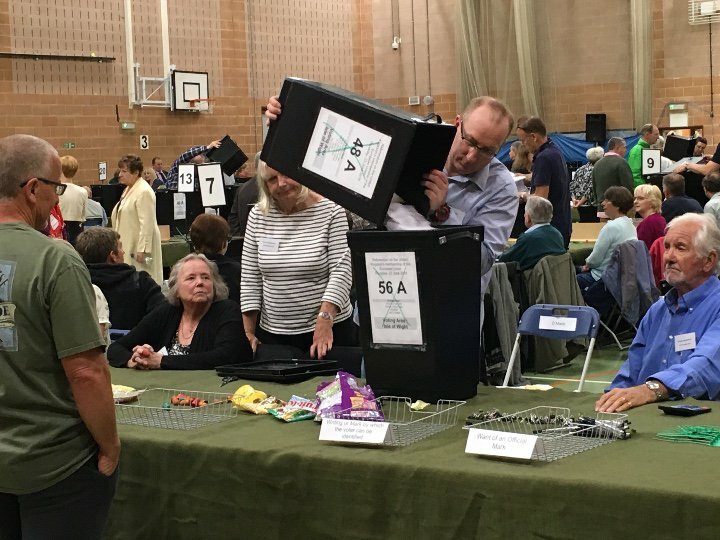 A total of 79,430 residents of the Isle of Wight placed their voting slips in the ballot boxes or took advantage of postal voting in the EU Referendum. With a voting population of 109,844 that is a 72.3% turnout. Continue watching the regional coverage from Southampton by our friends from Eastleigh News. There are a total of 382 counting areas across the Great Britain, including one area in Gibraltar and one in Northern Ireland. All local results will be fed to the 12 regions, before being collated and passed up to the national level. The last declaration – which will then provide the full national picture – is not expected to be complete until around 6am on Friday morning. According to the Electoral Commission, the rules don’t provide for a national recount “under any circumstances”. A judicial review is the only way the national referendum result could be challenged and this must be requested within six weeks of the result. What happens if Brexit is backed? If voters choose to Leave the European Union, Prime Minister David Cameron will trigger what’s known as ‘Article 50’. This is the formal mechanism for leaving the EU. A two-year negotiation period would commence, but some say it would take maybe ten years for GB to separate from the EU. We’ll be back on Friday morning to update you with the national picture. 66 Comments on "Brexit / EU Referendum: Isle of Wight vote results announced (Updated)"
Years of costly uncertainty await us. At least the IW is a prosperous location and should be able to ride the storm out without too much damage. .. oh wait. It’s called democracy…….whether the mandate is 1 vote or 1.2 million the people have spoken and we will have to accept the result. I hate the result. I think it’s disastrous. But it’s vital that we respect the democratic result. Without respect for and strenuous defence of democracy, we are nothing. This is a dreadful day for the UK. We must ensure it is not a bad day for democracy. DaveIOW – It is not a “dreadful day for the UK” but you will obviously not want to hear that. Britain will still trade with Europe and the pound will bounce back (although it may take a little time. You obviously have little faith in Britain. The low 37.4% (of the possible eligible electorate votes) result does not even meet the government’s minimum majority requirement to validate public sector strike votes, and it’s easy to argue that for something this divisive important and irreversible the bar should be set even higher. Sadly CHRIS the fact that the Pound is at a 30 year low against the Dollar and that millions have been wiped from the value of shares will affect a wider demographic than a few City Slickers. Working people’s pensions is just one example. Pointing out that this would happen never was the politics of fear. It’ll bounce back. And the stock markets. The kind of contempt for us and ordinary people has been much in evidence in Brussels this morning. They blame Cameron for allowing the people to speak, this alone has helped confirm to me that we were right to vote leave. The EU is rotten to the core. Do you not think that Germany wanted to control the whole of Europe – something Hitler could not manage in war? It’s already recovering! Project fear is behind you, don’t worry, have faith in our great country. Rejoice, we are free of the horrid anti-democracy EU. How can you say that the economy is ‘already recovering’? It’s been one day since the result. The process to Leave hasn’t started and isn’t likely to start for at least 3 months. We haven’t even started seeing the real effects of this decision yet. What I do know is that it won’t be big business which suffers, it will be the people. Thanks for the reassurance IM. I am always wary of those who wrap themselves in the flag. I agree this is great country, but never forget you don’t have exclusive ownership. What good news Its time for Briton to start a new trading body for all nations around the world free trade with all country’s. Is it time for our Independence from rest UK Isle of Wight to become a tax haven. Already been tried but we are too close to the mainland to be classed as “off-shore”. Makes me glad i never had kids. My heart goes out to the young people who have been betrayed by their elders and will endure terrible hardships and suffering in the decades to come. I voted to remain. I tried to save you but it wasn’t enough. I’m sorry. I thought voting was anonymous so I wonder where you got your figures from? It’s the results from a YouGov poll taken about a week ago. What a load of unreliable, made up rubbish. Newman’s ,so it’s the 18-49 age group who could not be bothered to vote,and would have to live with the consequences for the longest ,who are to blame for the result?. Keynes said “in the long term we are all dead”. May well be shorter for many of the Brexit voters than the Remainders then. Where was the UKIP candidate, or the passionate remainer contingent, like Vix? Isolationism will not help our reputation. The United States di quite well out of is isolationism 70 years ago. (Luisa) Review how federal states are controlled- USA from Washington, EU from Brussels. Very similar example of individual state laws and national Federal laws. Anyone who thinks that we have ‘got our country back’ is going to be very disappointed. Swap EU for Conservatives and I might be more hopeful for the future of the Island and country. Is the US you speak of the Federal Republic of 50 States and 318 million people that formed because they understood the importance of collective strength? …. after 200 years and a Civil War….! I thought you’d flounced off in a huff? (Luisa) do not confuse post-1951 EU history with European history over the last 1000 years.. It is all history that leaves a lasting cultural memory and from history we can see the direction of travel and (theoretically) learn from our collective mistakes. Particularly I would point to the NAZI party and their nationalism propaganda. We are already heading that way across much of Europe with the rise of right wing parties. I await Cicero’s research into how much EU funding the Island has actually received. I have him a short list off the top of my head but I’m sure he could find more. I forgot to include farming subsidies. (Luisa) I am relying on my friendly councillor to give me a head-start as it is difficult to find in the entangled and murky depths of EU files. When you post at five to one in the morning after a couple of pints, you run the risk of posting a double negative. I think you’ll get the point though. I have no sovereignty. I never have. I never will. I am in the hands of those elected to central government. Sorry but as far as I can see there was not much democracy within the EU. The big powers spoke and the minnows listened in trepidation. I am optimistic for the future and the next few generations will make their own prosperity without having to be dictated to by Brussels. If democracy comes from voting than I assume you believe North Korea is a democracy? and the Soviet Union was one too? They all have/had systems where people vote. Genuine democracy is where the people have genuine sovereignty. You are right, the Conservatives do remind me of a dictatorship. USSR and North Korea socialist dictatorships. So not much in common with Conservative Party and those of us who have supported the idea that the people should sovereign. USSR and North Korea socialist dictatorships. So not much in common with Conservative Party and those of us who have supported the idea that the people should be sovereign. Sorry Bob, you are of course correct. There is nothing ‘socialist’ about the Conservatives. Nico, I’m finding it difficult to be positive right now but I believe that you are probably right and today was a temporary knee-jerk reaction. However we have not actually started the Leave process yet. Let’s judge the markets then. Confusing….Nico apparently cannot resist the temptation to dance on my grave while I lurk here listening in vain for an OTW slap on other over-commentators.